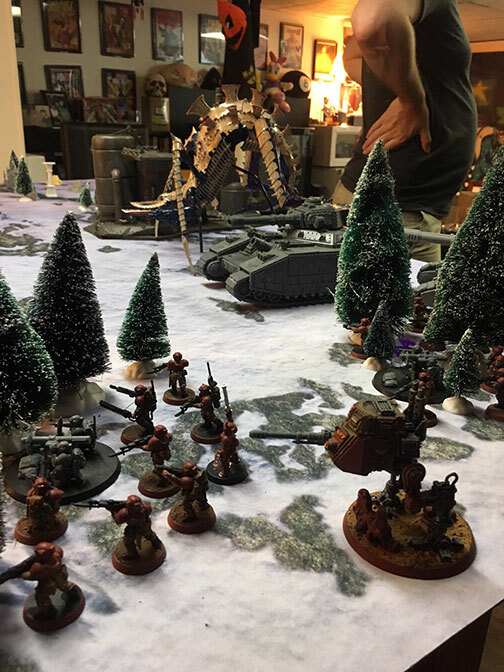 Warhammer 40,000 – Having played a few games of the new edition of 40K my gaming group decided to do a large battle bringing all out big toys to the table to see how they work in this edition. Initially it was going to be 6,000 points per side but one of the players had to bail so we dropped it down to a 4,000 point per side team game. I set up the battlefield before everyone arrived with a few larger LOS blocking terrain pieces in the center of the board and a balanced mix of trees an fences on the perimeters. Given the large stuff that was coming I wanted to be sure there was room for everything so the table was a bit sparser than I usually like. We rolled off to determine the matched play mission (evens for eternal war odds for maelstrom) and wound up with Contact Lost which is the decreasing Tactical Objective Mission. To keep it simple terrain was basic, infantry that was fully in was in cover everything else had to be obscured 50% from the shooter. The deployment type was diagonal and the Imperial/Tyranid team set up the first unit. They also finished setting up first so unless we could seize we'd be taking a huge amount of fire on the first turn. I tossed one of my purple dice onto the table and was relieved when it came up showing a raven (that's the six). First turn I moved everything forward but didn't Advance because this first round of shooting was going to be key. My partner shuffled the Warhound over to get a better bead on the Hierophant and Imperial Tanks. After the horrors tossed out a for Smites we moved into the shooting phase. Playing smart for a change we focused our shooting on individual units until they were eliminated with the smaller guns. Focused fire took out one of the Leman Russ Tanks scoring us First Blood. The Warhound splt his shots between the Baneblade and Hierophant. The first blast of the Dual Lasers vaporized the Leman Russ (no explosion) and the second took the Hierophant down to 5 wounds. 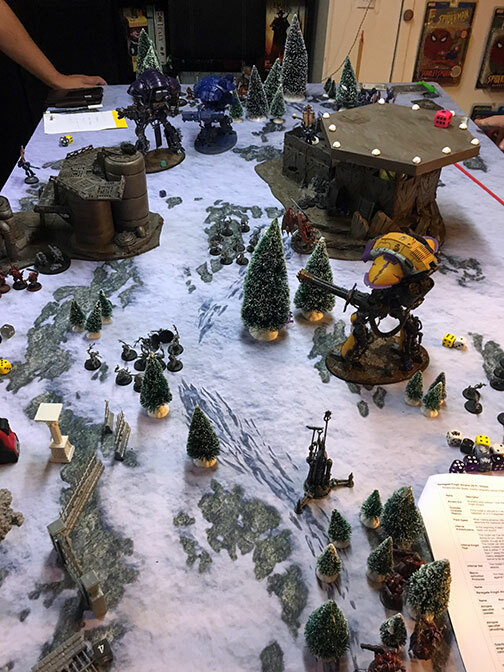 As I opted to hold back the Raptors nothing was within assault range so the turn passed to our Opponents. The return Salvo saw the Warhound crippled (and removed) and the Hierophant in combat with my Knight Atropos. Severely injured the giant beast was unable to get through my shields and the Laser cutter sliced through it's chitinous hide. As it thrashed about before it's death it caused wounds on the smaller bugs and did more damage to the Knight than when it was alive. This game left me with mixed feelings. First playing with super heavies when everyone brings some to the table is awesome. It's cool to do theme games like this where everyone is on the same page. The Macro Rule makes units with the Titanic Keyword die just as fast as everything else. So as long as you come prepared its not hard to deal with these god-machines. I can see busting these out once a month or every few months but playing against anything Titanic will probably get old if you do it to often. Which means that even though I love my knights I won't be bringing them out every week. So far the games I've played seem to hinge heavily on who goes first. Being able to pull off first turn assaults and taking out major threats is huge. That said the armies we've been playing are based on older builds and things we liked in previous editions. If you bring one giant thing to the table it's most likely going to get stomped by focused fire in the first few turns. I think I need to re-look at my terrain to be sure things are set up to block those lines of fire. It is significantly harder to set up terrain to mitigate those issues however since the six different deployment maps allow for much more varied games.